A major casualty of the euro crisis has been Europeans’ faith in the fairness of their economic system, according to a new poll by the Pew Research Center. In what is now the fifth year in the wake of the Great Recession, Europeans believe that inequality is now a major problem in their societies and think that things will only get worse. One consequence of the euro crisis has been a rise in income inequality in many parts of Europe. Inequality can be measured in various ways. One gauge is how much more of national income is earned by the top fifth of the population compared with that controlled by the bottom fifth. That ratio is on the rise in seven of the eight EU nations surveyed, according to calculations by Eurostat, the European Union’s statistical agency. In 2010, the latest data available, the top 20% of Greek earners commanded 5.6 times as much of Greek national income as did people living in the bottom 20% of the income distribution. In 2011, the Greek inequality ratio was 6.4. Over the same period, there was a similar rise in inequality in Italy, from 5.2 to 6.0, and a slightly smaller jump in Spain, from 6.9 to 7.5. As the rich have gotten richer, people across Europe have noticed, and they do not like it. A strong majority (a median of 77%) of Europeans surveyed think that the current economic system generally favors the wealthy. This includes an overwhelming 95% of the Greeks, 89% of the Spanish and 86% of the Italians. 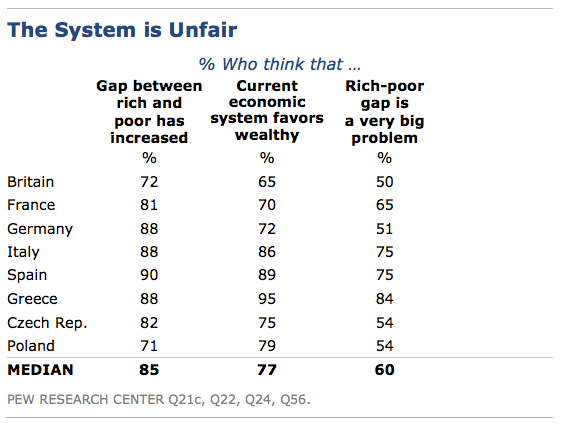 Even seven-in-ten (72%) Germans, who have fared economically better than other European, say the system is rigged. Moreover, the vast majority of all Europeans (a median of 85%) surveyed overwhelmingly agree that the gap between the rich and the poor has increased in the past five years. This is an almost universally shared sentiment, with nearly nine-in-ten Spanish, Germans, Italians and Greeks agreeing. And half or more people in all eight EU countries surveyed think the gap between the rich and the poor is a very big problem. This is a particular concern in Greece (84%), Spain (75%) and Italy (75%). With the International Monetary Fund predicting continued economic stagnation in much of Europe for some time to come, there will be no rising tide to lift all boats. Public attitudes toward the distribution of income and wealth could prove to be a growing political issue as Europe wrestles with the consequences of the euro crisis.